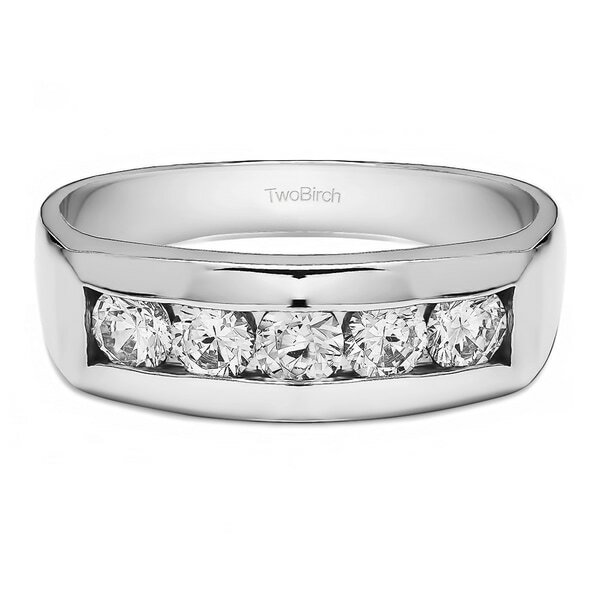 TwoBirch Sterling Silver Unique Men's Wedding Ring or Unique Men's Fashion Ring With White Sapphire (0.3 Cts. This ring features channel set stones adorned by a high polish finish. This ring is beautifully made with heavy channel to ensure that the stones are safe and secure. This is the perfect ring for anybody that likes to live in their jewelry. At TwoBirch, our rings are built to last a life time. Gorgeous White Sapphire is set into solid Sterling Silver. The craftsmanship and quality material ensure rings built to last a lifetime. Men's Wedding Band Buying Guide from Overstock.com. This guide will help you get started in your wedding band search, so you can choose a fitting symbol for your new life together.